interventions not required in law, and extends federal micro-management. which larger numbers of parents refuse to let their children be tested. voices that ESSA tried to restore. American people and Congress have rejected. I support the Comments submitted by FairTest on June 15 (Comment #). accountability structure and return authority to the states. which large numbers of parents opt out, as discussed above. promoted by diehard NCLB defenders. states to drop their use of levels. overall tone of the draft regulations emphasizes testing. actions regarding state accountability plans. and to select only one additional “non-academic” indicator. participate in ESSA’s “innovative assessment” program. Russ Walsh has what appears to be a concise write up on the NPE event yesterday which I could not attend but tried to follow online. What this teacher is going through is the sort of mindless edumalarkey that is driving many excellent teachers out of the classroom. She has asked that her story be publicized. I write this short essay to disclose what is happening within my own science classroom, I write to expose the demeaning work environment that I and my fellow colleagues must endure, and I write to give purpose to my years of acquiring the necessary skills and knowledge in teaching science for the secondary student. I am not a failure; however, by the Texas STAAR standard assessment test, I am since this past year I had a 32% failure rate from my 8th grade students in April, 2014. The year before, my students had an 82% passing rate. What happened in one school year? It does not matter that 2/3 of the student population speaks Spanish in their home. It does not matter their reading capability could be on a 4th grade level. It does not matter homework never gets turned in and parent phone calls bring little results. What does matter was that my students were required to develop a yearlong research project by stating a problem, thinking of a solution, designing the experimental set up, collecting the required data, and formulating a conclusion. Some of the projects were good enough to enter into the regional science fair. From a selection of thirty-five projects, twenty-four were sent to the regional science fair. Some of these projects won ribbons and a chance to go to the state science fair competition. Five of my students were invited to participate in the elite Broadcom Master Science Competition. No other 8th grader in my school district achieved this accomplishment. Other yearlong projects involved entering the Future City Competition sponsored by the IEEE. My eighth graders had seven teams to compete and three came back with special awards. Another science competition for secondary students is eCybermission sponsored by the NSTA and the U.S. Army. My only team of girls who competed in this program won first place for the entire southern region of the eCybermission Competition. Did any of my students get a thank you or congratulations from our school principal or the district about their science achievements? Sadly, the answer is a no. All I got was a call into the principal’s office at the end of the school year for the purpose of being pulled from teaching the 8th grade for the next school year due to my high failure rate on the state test. My students and I did receive two thank you letters from two community partnerships. The Potters Water Action Group, represented by Richard Wukich and Steve Carpenter were thankful for our educational brochure that my students helped design for their water filtration project. Krista Dunham, Project Director of Special Olympics in Fort Worth, sent a thank you to my students for donating the soap box derby race money that my students organized and who built three scrap box cars for this worthy affair. I am now being monitored on a weekly basis within my 6th grade classes and their posted grades. I am required to have a 15% failure rate. All assignments must be pulled from the district’s online teaching schedule; therefore, no soap box races or water brochures this year. I am not allowed to take any of my students off campus for data collecting. Student project development does not flow well in the district school calendar, so I am being questioned by the principal about my scientific teaching philosophy. Action science with real world data is not on the district’s curriculum website. It does not matter that I have a Ph.D. in curriculum development. I must teach to the test since every three weeks all students will be taking a mandated district test. This means all teachers must review for the test, students take the test, and then we go over the test. That is three days out of fifteen teaching days dedicated to a test every three weeks. Testing and retesting with documented lesson plans from the scheduled curriculum is what the district wants, but is it what the students need really to enjoy science? Our test scores are posted online and evaluated by the administration. Our performance on these tests weighs heavily into our yearly professional evaluation. I have been placed on a “growth plan” due to the fact that I teach what my students should know rather than what the district has posted. I am somewhat a rebel or just set in my ways; however, this growth plan gives the new principal her leverage to remove me from this school. If I do not meet her standards on the growth plan at the end of the year, then I must be relocated to another school. I teach my students math skills, writing skills, and research skills. I document this growth instead of monitoring their district test scores. I have been ordered to submit weekly announcements to the parent newsletter, but my submissions are deleted by the principal. I have been ordered to attend professional development at the level three tier within our district, but there is no level three offered because level three does not exist. I have been documented that 100% of my students do not understand my lessons when I teach because I use “big” words. The 100% came from asking two or three students in the classroom by the principal when she did her bimonthly walk throughs. I have been pulled out of teaching class to be reprimanded on my poor teaching practices rather than wait for my planning time. I must lower my standards and give less work if I am to maintain a 15% failure rate. Is this what the parents want? Will this prepare the students for high school? I can no longer incorporate the arts within my assignments since my activities do not come from the district’s website. The current push for STEM should be the banner to wave inside my classroom since I have been a secondary science teacher for the past thirty years; however, I could not and we should not trade the arts and music for pure technical science and math course work. Creative problem solving with visual displays or performing arts can be demonstrated instead of just technology and engineering skills. Language arts would implement the importance of writing and research instead of just writing a basic lab report. When a student is allowed to decide on what he/she would like to study for their research project so many necessary skills are required. The student must speak and “sell” their project by presenting to outside judges at the regional science fair, designing skills are needed for the backboard, mathematical and technological skills are used for the data collection. The actual meaning of “science” comes from the Latin verb, scire, “to know” via knowledge gained by a study or a particular branch of study (Ayto, 1990). To know encompasses all topics of interest and that is why I teach science bringing in all areas of skills and interests for the student to develop. This is not found on the district curriculum website. I want the student to be creative, to write, to sing, to explore, to draw, to decipher, and to act in order to gain “knowledge” through the sciences. I firmly believe students should have a choice in their own curriculum of study, final assessment should come from a variety of skills displaying the student’s individual growth, and what is taught inside the classroom should be applied to help the local community and school partnerships. My principal has cut my fifteen year commitment with community partnerships for the Fort Worth Botanic Gardens, Botanical Research Institute of Texas, and the Fort Worth Science & History Museum by not approving any of my bus requests. Action science does not exist. Science education lies only in the classroom and on the district’s website. This is the educational delusion I must work in; a science classroom that is data driven to the point of paralysis and where students no longer experience real world problem solving projects. Retirement is my ticket out of this madness, but what will be the student’s ticket out? An article in the Atlantic discusses the growing phenomenon of American students studying and succeeding in a wide variety of advanced mathematics courses and competitions. This includes organizations like MathCounts (which I coached at the JHS level for many years) as well as special summer math programs like MathPath, as well as math circles and AP calculus and statistics courses. National achievement data reflect this access gap in math instruction [between US poor kids and US rich kids – gfb] all too clearly. The ratio of rich math whizzes to poor ones is 3 to 1 in South Korea and 3.7 to 1 in Canada, to take two representative developed countries. In the U.S., it is 8 to 1. And while the proportion of American students scoring at advanced levels in math is rising, those gains are almost entirely limited to the children of the highly educated, and largely exclude the children of the poor. By the end of high school, the percentage of low-income advanced-math learners rounds to zero. When, about thirty years ago, corporate interests began their highly organized, well-funded effort to privatize public education, you wouldn’t have read or heard about it. They didn’t want to trigger the debate that such a radical change in an important institution warranted. If, like most pundits and politicians, you’ve supported that campaign, it’s likely you’ve been snookered. Here’s a quick overview of the snookering process. Talking Points: (a) Standardized testing proves America’s schools are poor. (b) Other countries are eating our lunch. (c) Teachers deserve most of the blame. (d) The lazy ones need to be forced out by performance evaluations. (e) The dumb ones need scripts to read or “canned standards” telling them exactly what to teach. (f) The experienced ones are too set in their ways to change and should be replaced by fresh Five-Week-Wonders from Teach for America. (Bonus: Replacing experienced teachers saves a ton of money.) (g) Public (“government”) schools are a step down the slippery slope to socialism. If you’ll read the fine-print disclaimers on high-stakes standardized tests, you’ll see how grossly they’re being misused, but they’re the key to privatization. The general public, easily impressed by numbers and mathematical razzle-dazzle, believes competition is the key to quality, so want quality quantified even though it can’t be done. Machine-scored tests don’t measure quality. They rank. It’s hard to rank unlike things so it’s necessary to standardize. That’s what the Common Core State Standards (CCSS) do. To get the job done quickly, Bill Gates picked up the tab, got the CCSS “legitimized” by getting important politicians to sign off on them, then handed them to teachers as a done deal. The Standards make testing and ranking a cinch. They also make making billions a cinch. Manufacturers can use the same questions for every state that has adopted the Standards or facsimiles thereof. What’s turned standardized testing into a privatizing juggernaut are pass-fail “cut scores” set by politicians. Saying kids need to be challenged, they set the cut score high enough to fail many (sometimes most) kids. When the scores are published, they point to the high failure rate to “prove” public schools can’t do the job and should be closed or privatized. Clever, huh? The privatizing machinery is in place. Left alone, it’ll gradually privatize most, but not all, public schools. Those that serve the poorest, the sickest, the handicapped, the most troubled, the most expensive to educate—those will stay in what’s left of the public schools. Look at standardized tests from kids’ perspective. Test items (a) measure recall of secondhand, standardized, delivered information, or (b) require a skill to be demonstrated, or (c) reward an ability to second-guess whoever wrote the test item. Because kids didn’t ask for the information, because the skill they’re being asked to demonstrate rarely has immediate practical use, and because they don’t give a tinker’s dam what the test-item writer thinks, they have zero emotional investment in what’s being tested. As every real teacher knows, no emotional involvement means no real learning. Period. What makes standardized testslook like they work is learner emotion, but it’s emotion that doesn’t have anything to do with learning. The ovals get penciled in to avoid trouble, to please somebody, to get a grade, or to jump through a bureaucratic hoop to be eligible to jump through another bureaucratic hoop. When the pencil is laid down, what’s tested, having no perceived value, automatically erases from memory. If you want to avoid cranking out the usual amateurish drivel about standardized testing that appears in the op-eds, editorials, and syndicated columns of the mainstream media, ask yourself a few questions about the testing craze: (a) Should life-altering decisions hinge on the scores of commercially produced tests not open to public inspection? (b) How wise is it to only teach what machines can measure? (c) How fair is it to base any part of teacher pay on scores from tests that can’t evaluate complex thought? (d) Are tests that have no “success in life” predictive power worth the damage they’re doing? Here’s a longer list of problems you should think about before you write. In fact, educating is the most complex and difficult of all professions. Done right, teaching is an attempt to help the young align their beliefs, values, and assumptions more closely with what’s true and real, escape the bonds of ethnocentrism, explore the wonders and potential of humanness, and become skilled at using thought processes that make it possible to realize those aims. Historically, out of the institution’s dysfunctional organizational design came schools with lots of problems, but with one redeeming virtue. They were “loose.” Teachers had enough autonomy to do their thing. So they did, and the kids that some of them coached brought America far more than its share of patents, scholarly papers, scientific advances, international awards, and honors. Notwithstanding their serious problems, America’s public schools were once the envy of the world. Now, educators around that world shake their heads in disbelief (or maybe cheer?) as we spend billions of dollars to standardize what once made America great—un-standardized thought. A salvage operation is still (barely) possible, but not if politicians, prodded by pundits, continue to do what they’ve thus far steadfastly refused to do—listen to people who’ve actually worked with real students in real classrooms, and did so long enough and thoughtfully enough to know something about teaching. Note: I invite response, especially from those in positions of influence or authority who disagree with me. The Washington City Paper has an article on the PARCC results with way more graphs and charts than I do, and they quote even Chancellor Kaya Henderson as saying the results were ‘sobering’. Please remind me why she still has a job? She and several other speakers said that the PARCC results were more ‘honest’ than the old DC-CAS results, probably because the new ‘passing’ scores are lower than the old ones. I guess that means that it’s more ‘honest’ to say that students are doing worse than we were previously led to believe, under the current regime of all-testing-all-the-time and turn-half-the-students-over-to-unregulated charters? I just got back from watching the public release of the results of the PARCC test that students in Washington DC took about 7 months ago. I got to see Mayor Bowser, Councilman Grosso, Chancellor Kaya Henderson, [powerless] Superintendent Hanseul Kang, and Deputy Mayor for Education Jenny Niles, and charter honcho Scott Pearson perform and answer some mostly-lame questions from some members of the media. What we saw were that advanced students in DC (largely white ones) do exceedingly well on this PARCC battery of tests, and that others (blacks; hispanics; SPEDs; students on free or reduced lunch; ELLs; or Students At Risk) do much worse. Which of course is the very same result we’ve seen on the NAEP for a couple of decades. In fact, of all the cities and states measured on the NAEP, Washington DC has the very widest gaps in test scores between the Upper Caucasia Haves and the Have-Nots everywhere else, and those gaps are if anything getting wider. (2) It takes a long time, you can’t just expect to turn a switch and have everything be wonderful overnight, we need lots of wrap-around services and a longer school day and school year and support for teachers. Regarding the latter excuse: isn’t that exactly what teachers were condemned for saying under Chancellor Rhee, whose understudy was none other than Kaya Henderson? Didn’t Rhee imply that the only reason that poor students did poorly in school was that their greedy, lazy teachers, empowered by their evil union, refused to teach them anything? And that anybody who said that it’s a lot harder to teach impoverished students of color with chaotic families (if any) than it is to teach middle-class children with educated parents – why those people were just making excuses for poverty? 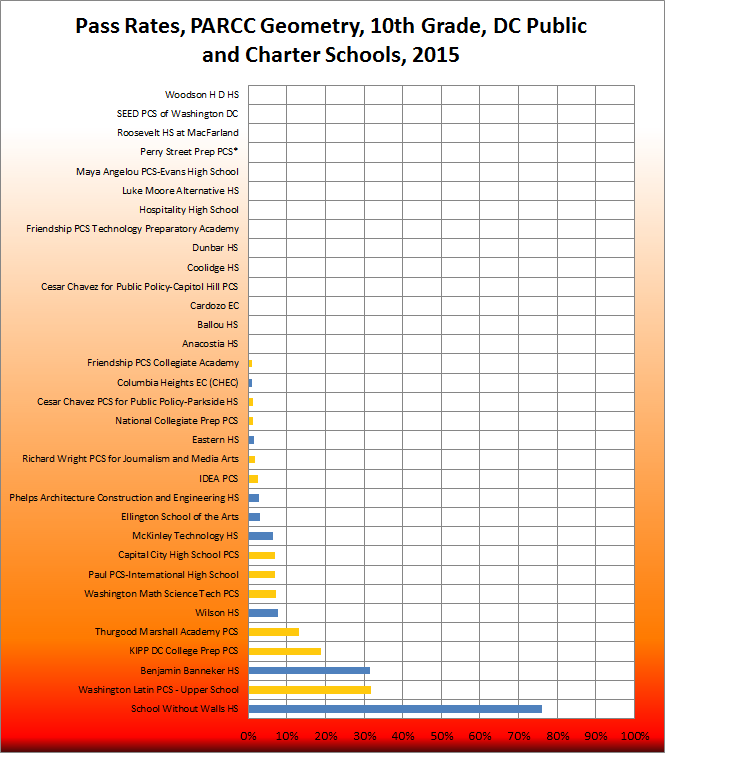 I present a couple of graphs so that interested DC locals can see how the students at the various public and charter schools did on the PARCC test this past spring in reading/ELA and in Geometry. Not all schools are listed, because quite a few did not have enough students taking the test. At least 25 student were needed for their scores to be reported. If the school does not have a bar next to the name, that means that nobody at that school got a 4 or a 5. As usual, you can click on the graph to make it larger. 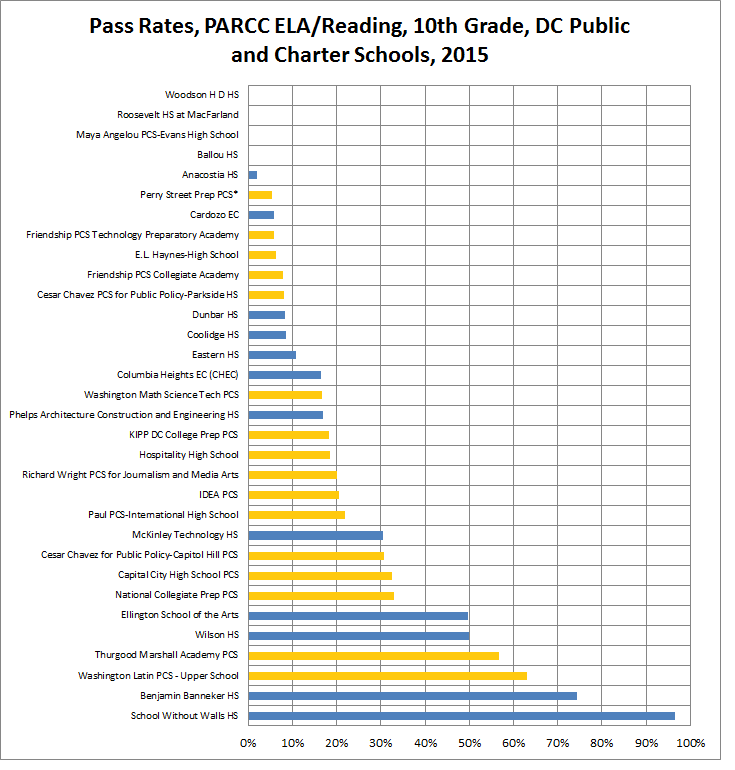 I color-coded the bars: blue for regular DCPS and orangey-yellow for the charter schools.